As I sit here I am having a horrible time focusing today. 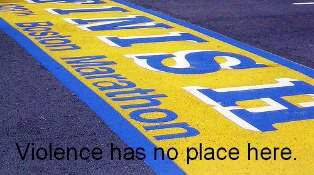 I didn't sleep well after everything that happen at the Boston Marathon yesterday. I read other people's blogs and I realize it may be a good way to get some of the emotions out of my brain and down on paper (or the screen) and honestly it feels almost like a support group. This one hit me pretty close to home in more ways than one! I worked at the expo on Friday in the Clif Bar booth. I saw a few of my friends who were running on Monday. Then on Saturday I went in and spent the day in the toy shop. The Boston Marathon expo is like spending the night before christmas in a toy shop picking out your toys! I wasn't running this year and neither was D but I had a lot of friends running like always. The morning of the race I messaged my Dad, he has bandit run like 13 Boston Marathons. I always think of us at 17 to cheer him then going into the Finish on Marathon Monday. It was my childhood. And probably one of the big reasons I have always had a love for Boston. He said how he misses it on Marathon Monday in the morning. In 2011, D ran Boston, I went to the same spot I went to cheer my Dad as a kid. Mile 17 right at the T station. I ran up to him gave him the fuel I had and with my friends boarded the T to head to the finish. Yesterday I had a meeting to call into then I ran down to the water station at Mile 10. I got there just in time to see Nat come flying by- I ran possibly the fastest I have ever run to get there in time. Then I stood with D as we waited for other friends to come by we screamed for Sam,Sarah, Alett, and many other friends as they went by. A friend from my winter computrainer classes was running her first marathon yesterday at Boston so when she came by I ran a block or so with her then headed back to D. Then my friend Lisa came, we knew she would be so excited to get to see us so we stayed to see her. After she gave us both a hug I ran with her through Natick Center and almost to the mile 11 water stop. It was such a great experience to get to run with her just briefly. She even joked asking if I would run the rest of the way with her. I'm not gonna lie a little part of me considered it. As I gave her a hug and kiss and as I ran back to work I started thinking about the Boston Marathon. My Dad has said he would run it again- he would like to do one more. I started thinking next year he turns 60- a couple weeks before the marathon. Maybe that would be a really cool thing to do- run together right after his 60th Birthday. I was really happy when I got back to work on a super runners high. D wasn't feeling well so we headed home a bit early. Just as we were headed home the USA today notification "Bomb at Boston Marathon Finish Line" came over his phone. On the ride home I frantically called all my friends who were running, leaving voicemails mostly. I also had a really good friend who was at the finish spectating, who messaged me before D's phone went off saying "There were just bombs". We finally got home and I spent at least an hour calling friends, answering messages from my friends checking on me, and checking twitter and facebook for updates on everyone. Luckily everyone I know of was okay. I had friends right there and luckily they were all okay. I wore my BAA Half shirt to work today as a sign of unity for the running community. I walk around today with my head spinning. I didn't sleep well. I had horrible dreams. And I just keep feeling as if my family was attacked. To be honest- it was! I don't know any other way to describe it. The running community and the endurance athlete world is less than 6 degrees of separation. I mean just about everyone knows someone you know. Not only is there that but I really have a strong connection with the Boston Marathon growing up in the area and with my Dad running so many of them! A real blow to me was when D realized his finish time in 2011- after a horrible race- was exactly as the bombs would have been going off. As he said I would have been somewhere in the meet up area waiting for him not watching him cross luckily, but he would have been right in the thick of things. And hopefully if he had run this year he would have finished a lot earlier and we would have already been out of there. I know thinking about what ifs isn't a good thing- but it really makes you realize how precious things are and how in a moment things can change. I walk around today with a heavy heart for my family. I will be running my first Marathon in October. I just keep thinking about how the world has been forever changed by this event. This will not stop me from running or training or racing! If anything it makes me realize how great the community of athletes are and how I am lucky to consider them my family!